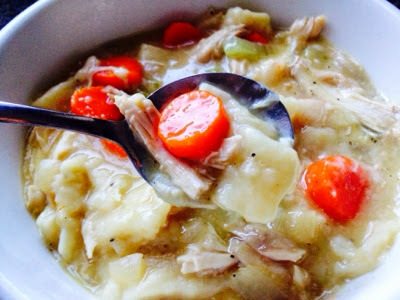 There is nothing better than comfort food during the cold New England months. We have had way too much snow this winter and I keep dreaming of green grass and warmer days. 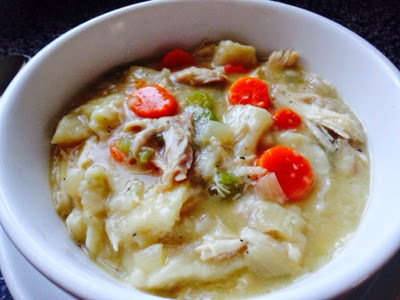 Until then, I'll settle for a bowl of comfort food: Chicken and Dumplings. 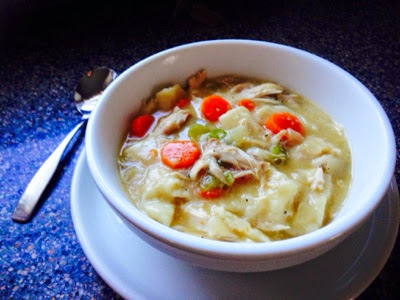 I love homemade chicken and dumplings. By homemade, I mean made from scratch - not from a can of pre-made biscuits. And honestly, these dumplings are super easy to make, even if you are not an experienced cook. 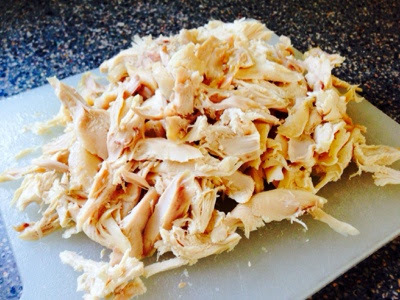 To save time I use a rotisserie chicken, but you can roast your own chicken and shred it for this recipe as well. 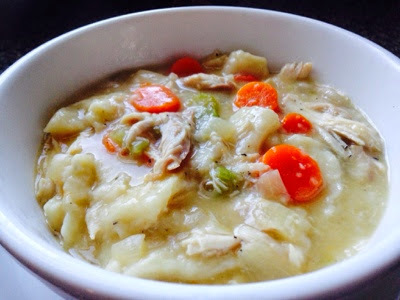 This recipe makes a huge pot of chicken and dumplings. 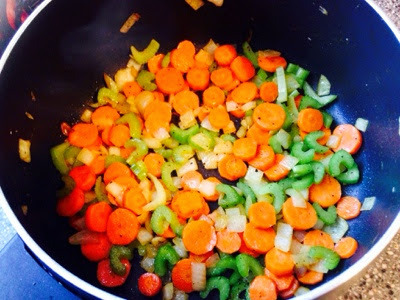 I added veggies to the recipe I found, because I love carrots and celery, and it adds a punch of color and nutrition, but you can leave them out or add other vegetables if you want. 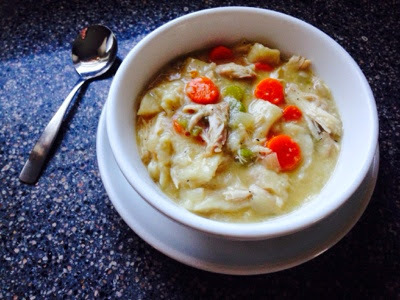 The key to chicken and dumplings is to let the dumplings cook at a high temperature initially, and then to let them simmer for a while to cook out the flour taste. I actually made this on the stove top and then transferred to a crockpot (slow cooker) for the rest of the afternoon until dinner time. Just beware that the longer this cooks, the thicker it will get. 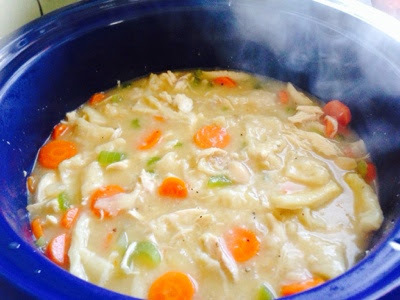 I actually had to add a can of chicken broth after it had cooked in the crockpot, just to make thin it out slightly because it had thickened up so much. Heat a large soup pan over medium heat. Add butter and oil. Add your chopped onion, carrots and celery. Season with salt and pepper. 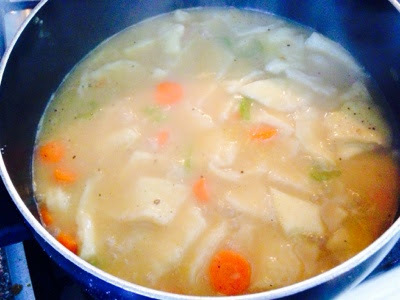 Cook over medium heat for 4-6 minutes, until the vegetables start to soften and lightly brown. 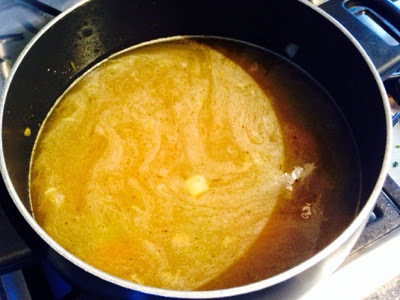 Now turn the heat to high and add your two quarts of chicken stock or broth. 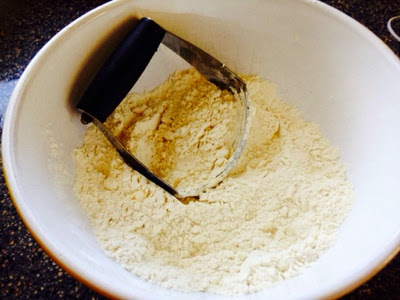 In a bowl, combine the flour, salt and baking powder for the dumplings. Using a pastry cutter or a fork, cut in the butter. You want the butter to be the size of peas throughout the flour mixture. 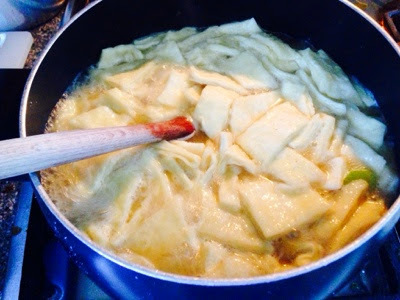 Next, add the milk to the dumpling mixture and stir until the dough comes together. 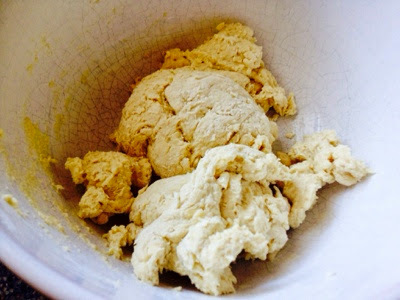 On a well floured surface, dump out your dumpling dough and knead to combine for 30 seconds. 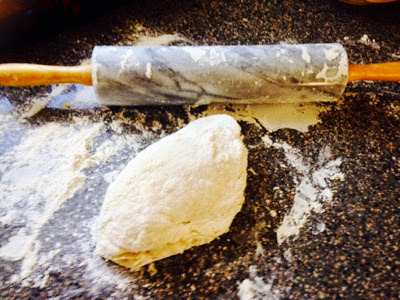 Using a well floured rolling pin, roll out the dumpling dough. You want it to be THIN. Like 1/8 to 1/4 inch thin. 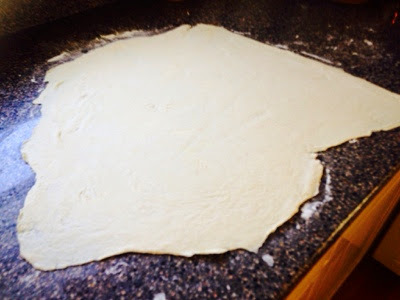 Using a pizza cutter, cute the dough into 1 inch squares. This doesn't have to be perfect, we are going for the rustic look. 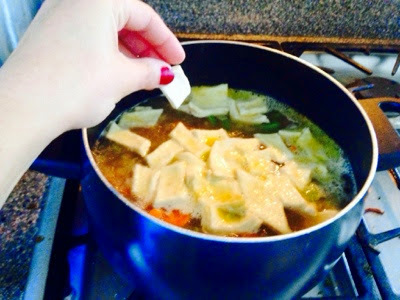 Once your pan with the stock is boiling, add the dumplings one by one, stirring after you add a few. 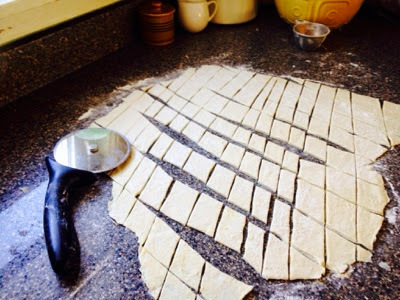 You do not need to add ALL the dumplings you cut, I think using about 3/4 of the them is plenty. You need room still in the pan for the chicken. Your dumplings should start to puff up slightly. Cook them for about 10 minutes or so, stirring carefully every couple of minutes. You don't want to break up the dumplings. This is what it should look like. It will smell heavenly. Now shred up your chicken. You can add as much or as little as you want. 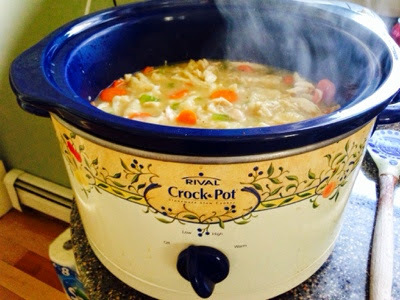 I use a whole rotisserie chicken and had about 4 cups of shredded chicken total. Add the chicken to the pan, stirring carefully again to combine. Now season well with a little salt and a lot of pepper. Taste to be sure your seasonings are on point. Now at this point, you could serve and eat, but I like to cook this a little longer to thicken it more and develop the flavors. You can simmer over low low heat for 30 minutes or so, or you can transfer to a crock pot like I did. You really don't need this to cook much longer, so I used the slow setting for about 60 minutes and then turned to warm. Cover and let the flavors merry. 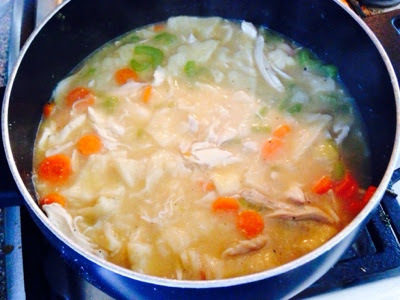 Right before serving, I added another cup of chicken stock because it was so thick. The flour from the dumplings will do that :) You can decide how you thick or thin you want this to be before you add more stock. Just remember this is not a soup, it is more like a stew. 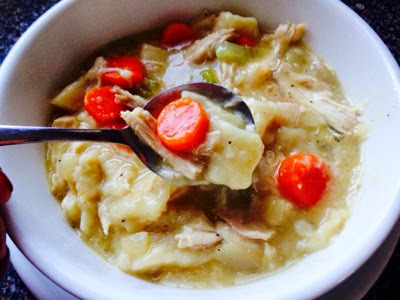 This was the perfect comfort food for a snowy night. I can't wait to make it again! Happy Winter.